Every season seems more alive the more time we spend outside enjoying it. With all the demands on our time, it can be hard to remember to take just a minute here and there to enjoy the wonder of a changing season with our children. Here are a few ideas to mark the glory of fall. Some are quick, the sort of thing you can do between the house and the car, and some mean a few hours of fun. Apple Picking– This one is super easy in Vermont. It may not be apples in your locale, but try to find a way to tie what your family eats to where you live. Late summer and early fall can be bountiful in all they have to offer, from corn to pumpkins to apples. Leaf Gathering– Trees can make a brilliant show as they get ready to drop their foliage. 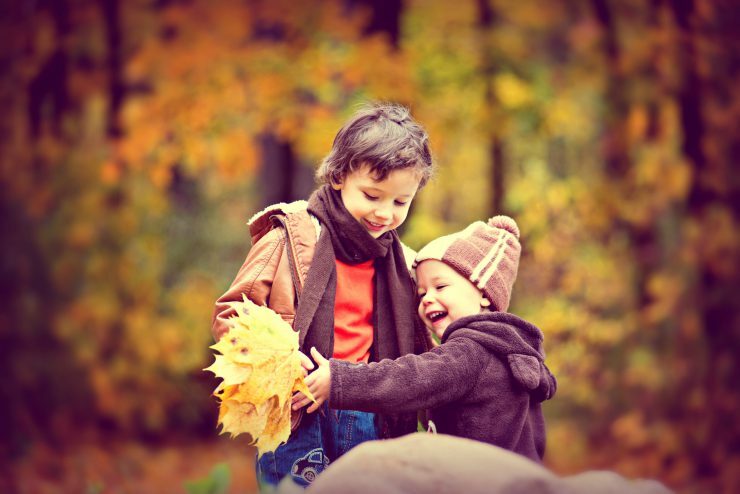 Just noticing the falling leaves and their colors is enough to heighten your child’s awareness of the changes in nature. Spending some outdoor time trying to find as many colors as possible can be a treasure hunt that leads to a gorgeous centerpiece for your dining table or nature corner. Seed Search– This one is a natural outcropping of the leaf gathering. There are so many types of seeds that spread in the fall. You might be as amazed as your child when you start looking for them. There will be grass seeds and different-sized acorns; many wildflowers will have seedheads just waiting for a stiff wind to disperse them. You can make it a teaching time about all the ways plants try to spread seeds, or you can simply marvel at the diversity of nature. Tree Skeletons– A “tree skeleton” is what we see when all the leaves are gone. When we were homeschooling, a favorite activity for about 7+ was attempting to capture the intricacies of the bare tree with charcoal pencils and paper. We often saved this one for early winter, but it can be fun to start noticing in fall and then mark the changes. If your child finds a favorite tree, they can also see how it actually continues to change throughout the winter, its “dormant” period. The trees will usually begin to anticipate spring long before the calendar does. Bird Counting – Bird song defines the mornings of late spring and much of summer. However, even in August, the songs have pretty much ceased. Counting the types of birds that gather at a feeder or the number of songs you can discern can once again call to your child’s attention the way all of nature changes through the year. Once you and your child begin to recognize particular songs, you’ll notice when they leave in autumn, but also when they come back in spring or summer. In Vermont, the chickadee is a favored bird for their song that persists through the winter. In warmer climates, you might notice other birds who only arrive as the weather turns cooler. 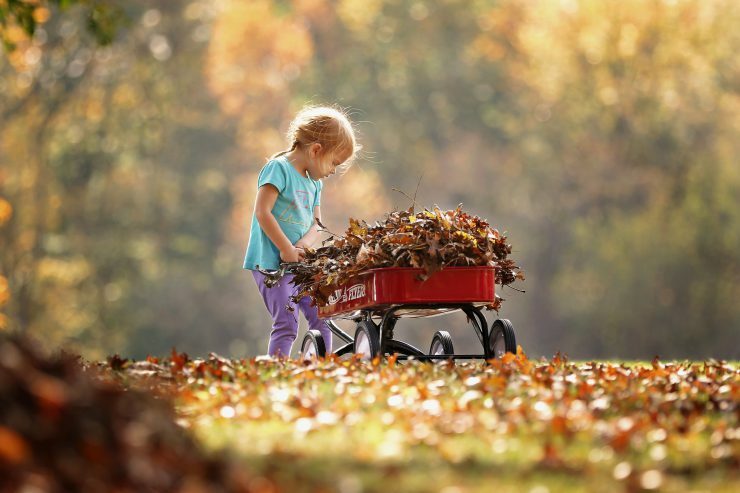 Leaf Piles– Grab a rake. And jump in! Bedding Down the Garden– Getting your yard or garden ready for the coming winter not only benefits your scrap of nature, but it also reinforces the ideas of stewardship and gratitude between people and nature. Use the gathered leaves to protect roots from cold or garden soil from erosion. Putting away summer toys keeps them in good order for the next year, and choosing the best spots for birdfeeders when the weather hasn’t gotten too cold helps ensure that you’re ready to tend a few little souls through the darker days. 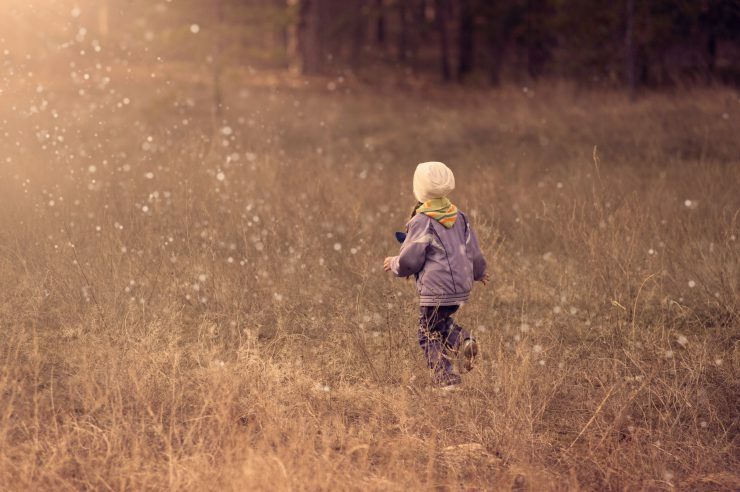 Sacred Spot – Invite your child to choose their own spot in your yard or a park. Let this be a place they tend and use for contemplation and observation. If you can integrate visiting the spot into your daily or weekly rhythm, they will most definitely notice how it changes. If it’s a leafy bower, they will see it go bare with winter, or perhaps they’ll notice their place under a hemlock stays sheltered year round. They are more likely to find evidence of other visitors, four- or two-footed, if they have a regular time to visit their corner. Weather Watching – A perfect walking to the car activity! Just notice the weather; a nice touch is to only notice it, not complain. That can be hard in Texas in August or Vermont in January, but cultivating an appreciation for all nature has to offer or wondering at the power of nature is a special gift to our children. You can extend this one by having a calendar to mark with weather highlights or even a place on your seasonal table to show weather changes. Kite Flying – We often think of this as a way to spend a summer day, but fall weather with its winds and milder temperatures is often ideal to launch a kite. If you follow the Waldorf festivals, you can tie your kite flying into Michaelmas, adding dragon features to the face of a homemade kite. Whether you make your own or go with store-bought, you’ll savor the stories and conversation to be had when you and your child are quietly tethered to the handle of a kite.